Holly, I took a 2 month hiatus from building during the holidays. Mainly because my building area reverted back to the dining room and kitchen table. 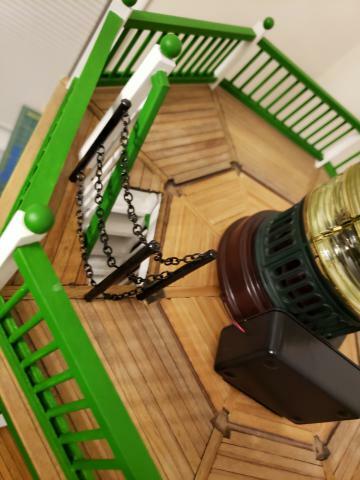 I've been working on the lighthouse keepers house and will post pictures sometime soon. The lighthouse itself just needs a few interior lights installed and it will be finished, maybe. Ron, short line, narrow gauge steam logging is my area of interest also. Geared engines and one-off, unusual logging cars especially. I love your boom truck. I like what I see. I really like the addition on the right side of the house. Good job! 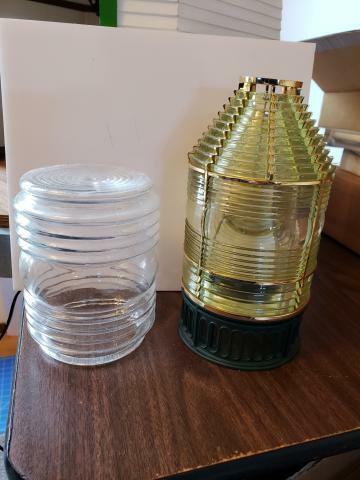 The Fresnel Lens is made by Harbour Lights. I got mine from thecapecodstore.com. They are made from real glass and real brass. They are hard to come by, and cost a very pretty penny! But well worth it, in my opinion. This is why I had to have the Fresnel lens. It looks so amazing in the lantern room with the flashing beacon light. Even though it's a replica, it actually works like a real Fresnel. By the way, it is a 3rd order Fresnel. 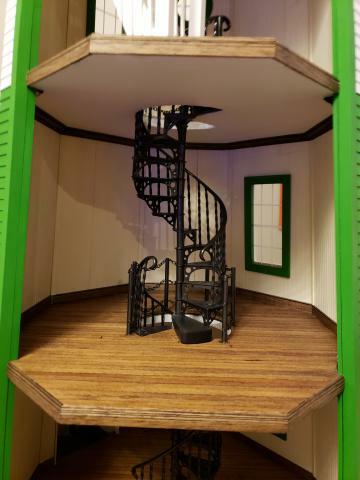 I must give credit for the Fresnel lens idea to Brae and her Otterine's Miniatures blog about her Walnut Bay Light. I may not have known about this amazing replica otherwise. 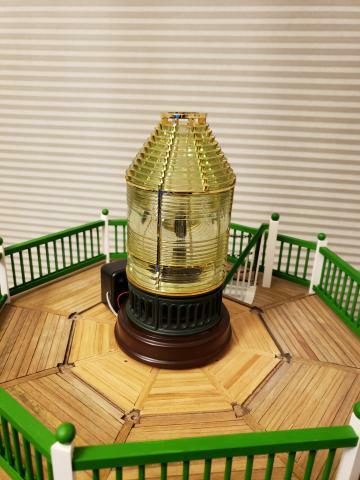 The beacon is the 1/12 scale GRS Light House Beacon from Cir-Kit. Everything Is Awesome! 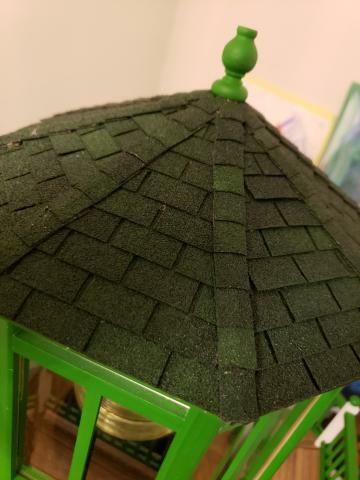 The green asphalt shingles I got were so dark they looked black. I thinned some of my green paint with water and gave the shingles a good wash. The variation in color that resulted was perfect. 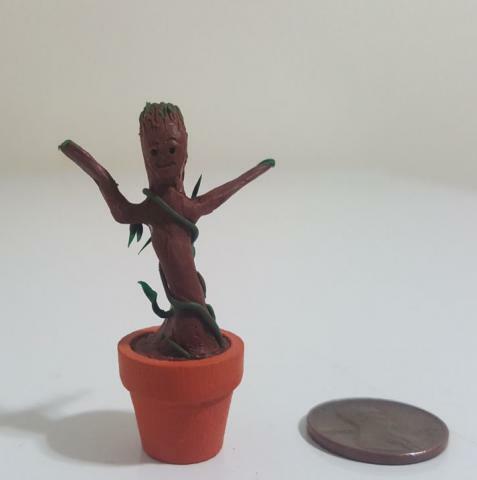 I glued them down with Quick Grab. Inside and outside decking. Top of stairs. Beacon electronics in black box. 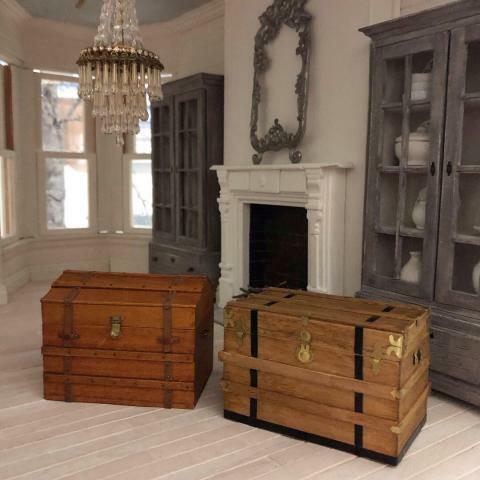 What was the first furniture item you made? Mine were Carl and Ellie's chairs for my UP house. Ellie's was from a kit by 1inchminisbykris, Carl's was scratchbuilt following Kris' instuctions. I also followed her suggestions to make them looked well used. I made the lamp table from an HOM kit. 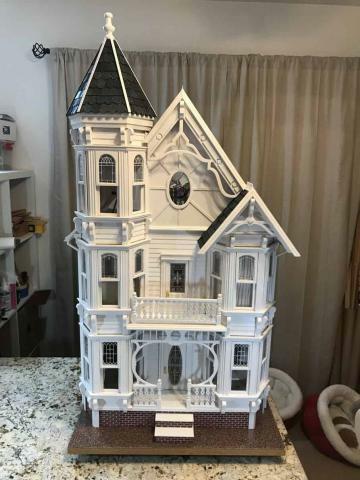 The chairs went with the house when I gave it to my granddaughter. 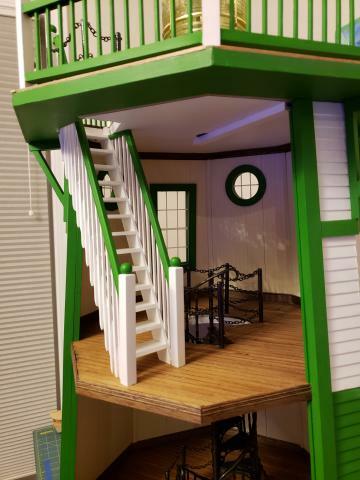 I didn't like the ladder that came with the kit, so I modified these stairs by adding the rails and banisters. I built the chain safety rails and posts.